Electrolytes are chemical compounds such as liquids or gels that contain ions and can conduct electricity when molten or dissolved in a solution. Electrolytes are necessary for batteries to function and for cells to regulate their electrical charge and the flow of water molecules across cell membranes. Excessive sweating, dehydration, vomiting or diarrhea can cause a loss of electrolytes and can severely impact the healthy functioning of the body. Here you will find some examples of electrolytes. Sodium chloride - Also known by the formula NaCl, sodium chloride is a compound with equal parts sodium and chloride. 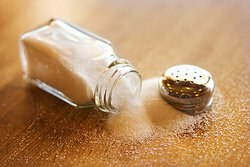 It is more commonly known as "salt" or "table salt," and is the major ingredient in the edible salt that is sprinkled on food to make it taste better. Sodium chloride is present in the ocean and is the main thing that makes ocean water taste so salty. Nitric acid - This strong mineral acid, known by the formula HNO3, is a corrosive acid used in many applications, one of the most common of which is an ingredient in types of fertilizer. It has also been used as one of the ingredients in certain types of liquid rocket fuel, and is a chemical used in woodworking to make wood look like it has been aged. Chloric acid - HClO3 is another name for this particular electrolyte, which is a very dangerous oxidizing agent. It can be produced by a chemical reaction. Hydrocholoric acid - This strong acid is widely used in the chemical industry, but is also an ingredient in gelatin, leather, and household cleaning supplies. Calcium chloride - Although this is also a "salt" by definition, it is different from the table salt described above as sodium chloride. Calcium chloride is a compound made of calcium and chloride, and is one of the types of salt used to control ice on sidewalks and roadways. The compound is often produced from limestone. Potassium nitrate - This electrolyte, commonly known by the formula KNO3, is used in a wide variety of substances. It can be used as a food additive, but is also an ingredient in various types of rocket fuels and in fireworks. Potassium nitrate was once known as saltpeter and was an ingredient in gun powder for many years. Sodium hydroxide - With many uses throughout history, sodium hydroxide - also known as lye - is an important ingredient in many detergents, soaps, and drain cleaners. It is highly dangerous because of its ability to decompose lipids and proteins in skin, causing burns when not handled properly. Sulfuric acid - Once known as oil of vitriol, this highly corrosive strong acid (known by the molecular formula H2SO4) can corrode metals, organic compounds, living tissues, and even stone. It is used as an electrolyte in certain types of car batteries to get the electricity to flow. Like sodium hydroxide, it can cause very severe chemical burns when it comes into contact with skin, so it is very important to handle with extreme caution. Sodium acetate - Yet another electrolyte that includes sodium as a main ingredient, sodium acetate is often used to seal concrete so that it is protected against bad weather. It is also used as an ingredient in certain types of foods, such as salt and vinegar potato chips, because of its salty and tangy flavor when mixed with other seasonings. Magnesium hydroxide - Because of its milk-like appearance, this electrolyte was long known by the name "milk of magnesia." It is a main component of many types of laxatives and antacids, and in underarm deodorants and antiperspirants. It can also be applied to the scalp as a form of seborrhea and dandruff control. Each of these substances are examples of electrolytes because they have the specific property of being able to conduct electricity when they are in molten form or when they have been dissolved into a solution. "Examples of Electrolytes." YourDictionary, n.d. Web. 23 April 2019. <https://examples.yourdictionary.com/examples-of-electrolytes.html>.